Here I am going to explain how to upgrade an existing MOSS site (SharePoint 2007) to SharePoint 2010. Based on the environment and the other factors we will determine which approach is suitable for us. You can find more information regarding this in TechNet here). 7. Analyze If any errors related to customization ,missing files etc. 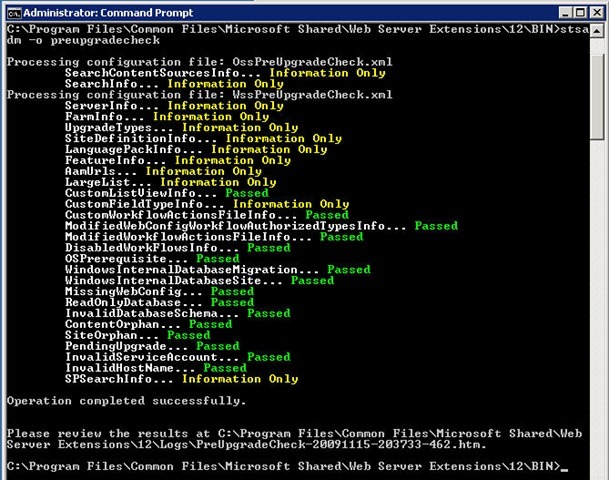 MOSS Server should have service pack2 Installed on it, without sp2 the preupgradecheck will not run. 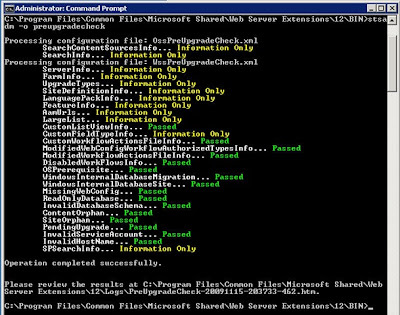 The preupgradecheck command will give us the information about the Sharepoint 2007 Farm and the actions that need to be taken before we upgrade to sharepoint 2010. This is a nice tool provided by Microsoft, which will analyse and gives us the report in html too. More on Preupgradecheck rules find here .If you get success message you can continue for the upgradation. Take the Backup of your moss site's content database(WSS_Content_5485). Go to SQL server-->Select your contentdb(Wss_Content_5485)-->Tasks-->Backup. Select a location to keep your backup. Now Copy this Backup and place in Sharepoint 2010 server. Click OK on above.And now restore your moss content database in to 2010. Go to sql -->Right Click on Database-->RestoreTo Database : select Wss_Content_4311. Now run the Test-SPContentDatabase PowerShell cmdlet to test your database( the above restored moss contentdb) is ready to upgrade or not . It will tell you what are the missing files ,features, assemblies etc. In 2010 server Go to Start Button -->All programs-->Microsoft SharePoint 2010 Products-->SharePoint 2010 Management Shell --> Run as Administrator(it is must otherwise gives u access denied error). In Our case : Test-SpContentDatabase -Name Wss_Content_4311 -WebApplication http://trainingsp2:4311. It will give you all the information of missed files and assemblies etc..